Click on drawing to see a larger version of this cutaway drawing. The following information is taken from 'Southern Electric A history of the world's greatest suburban electric railway system' ' by G.T. Moody published by Ian Allan in 1957. "For some time complaints had been made of overcrowding on rush-hour services from Charing Cross. One daily paper described the 5.45 p.m. to the Bexleyheath line as the " Sardine Special " and published an illustration to show 26 people standing in a guard's compartment. Although introduction of new sets of six-a-side stock eased the position somewhat, complaints persisted and the matter was raised in the House of Commons. Speaking at Lewisham in April, 1948, the Parliamentary Secretary to the Minister of Transport said that the solution of travelling difficulties in South East London seemed to be the introduction of double-decked trains and the Southern Region were making investigations in that direction. Two four-coach double-deck sets were designed by Mr. 0. V. S. Bulleid and built at Lancing and Eastleigh works. The design was not double-deck in the road transport sense, but an ingenious arrangement of alternate high and low level compartments in a coach mounted on a standard 62 ft. under-frame. 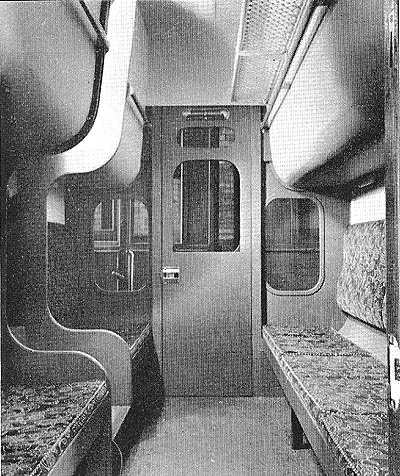 Each set contained 22 high and 24 low-level compartments seating 508 persons, plus 44 tip-up seats, giving a total of 1,104 seats in the eight-coach train. Owing to the restricted clearances the windows on the upper level were fixed and a pressure ventilation system was installed. The sets were limited to the routes between Charing Cross, Cannon Street and Gravesend Central. The new train was inaugurated on November 1, 1949, by the Lord President of the Council and the Minister of Transport making a special trip from Charing Cross to Dartford and back, and it went into public service on the following day. It was found necessary to send the train back to works for adjustments on November 3 and it did not return to service until November 18. As further adjustments were found to be needed, the train went to works again on November 23 and did not resume service until January 6, 1950. In December, 1950, it was decided that no more double-deck trains would be built. In practice it was found that the passengers had less room and less comfortable seats, and the ventilation was inadequate. The train had only a restricted use, and working was slower as there was only one door to 22 seats, instead of one door to ten or 12 seats on other suburban stock. The best solution of the overcrowding problem appeared to be the running of ten-coach trains, but this would need extensive platform lengthening and other works. There were only two four coach sets of this type-Nos. 4001-4002-each 257 ft. 5 in. by 9 ft. 3 in. overall, and weighing 136 tons. Motor coaches seated 55 " high " and 55 " low " level passengers with 10 " tip up " seats on the high level. Trailers seated 66 " high " and 78 " low " level passengers with 12 high level " tip up " seats. In all 1,104 seats were provided in the eight-coach train. English Electric equipment included lightweight ventilated motors with electro-pneumatic control gear, and Westinghouse electro-pneumatic brakes were fitted. Underframes were of deep girder type, with bolsterless bogies of special design and steel disc wheels with the tyres welded on. The all-steel bodies had neither commode handles nor footboards, and the guard's and motorman's compartments were inset. When the compartment doors were open they showed a metal edge to the step reading " MIND THE GAP." Strip lighting was fitted and a pressure ventilating system, controlled by the guard, as the upper windows were fixed. The seating was thin and hard, with limited headroom, and the " tip-up " seats were placed so that a passenger using them sat almost on a level with other passengers' feet."